With this course you will learn about the principles of written communication in a modern business environment. With this course you will learn about the principles of written communication in a modern business environment. You taught about how preparation is crucial for successful writing and to use a planning checklist when writing any type of business message. You will then learn about the rules that govern written language, after which you will be introduced to different writing styles and instructed on how to choose the right style for different situations. The course will then discuss a powerful skill- the ability to prepare and present information in a way that will increase understanding, retention, and motivation to act. The course will then discuss of the legal implications of business writing, before moving onto the section on business letters. where, you will be guided through the three basic layouts of business letters, the function of these letters, and be shown how to write a professional, high quality business letter. Professional writing skills are so important in the modern business world. Whether you are sending an inquiry to a company or organisation, or writing a job application, having a correctly formatted letter can make the difference between being taken seriously or not. 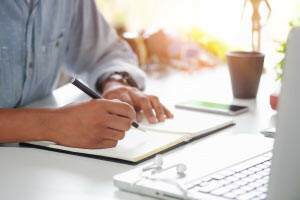 After completing this course, you will have gained the confidence and skills needed to write professional texts that are distinctive and high quality, a skill that serve you throughout your life. Describe the three basic layouts of business letters.